Submitted by akreider on Tue, 03/29/2016 - 23:24. I'm learning a lot and have made significant improvements to my model. Notably I've added a turnout variable - and am assuming that turnout will be proportional to Obama's presidential vote in 2012. While this is likely flawed, I don't have a better idea on how to predict turnout. I added FB likes by county. 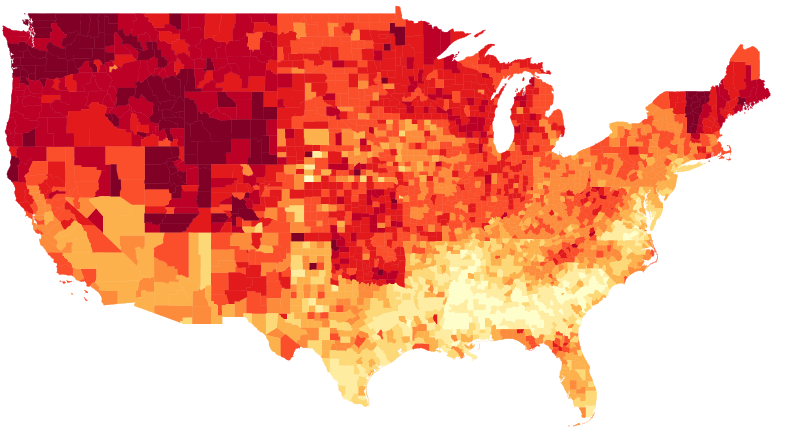 Interestingly the FB likes by state are still significant. I created a caucus-only model which has a much smaller confidence interval for its estimates (40% of the general model's interval). And betting odds from PredictIt.org - note they use the chance of winning, whereas I'm predicting vote support. It is interesting how well my predictions fill with those of Predictit -- maybe I should include that in my model. If you assume that one standard deviation is equal to 15%, then you'd have a 31.8% chance that the result would be more than one standard deviation away - and a 15.9% chance that it would be more than one standard deviation away in the same direction (eg. that it would flip from Clinton to Sanders). So Predictit's 81-88% scores are rough estimates of how large people think 1 std deviation is - if you average them you get (14.5+ 16 + 22 + 7.5) / 4 = 60/4 = 15%. This means you have a 15.9% chance that the result could deviate by 15% or more, and a 2.3% chance that the result could deviate 30% or more from the polls (or my estimates) - which means that one of the 50+ races is likely to deviate a lot. This might be an over-estimate and/or the result of polling failure in Michigan. Note that this model has a terrible record and has been outperformed by polls and other models. However this is the "new and improved" model that features a turnout variable. We'll see soon how the WI prediction holds. The model ignores polls and is based on demographics, FB likes, and past voting. I could easily be off by 5-10%. I'm hoping to be off by less than 5%. On a practical note, what can Sanders supporters learn from this? I'm going out on a limb and saying that If you want Sanders to win - focus on recruiting FB likes. While this might be totally wrong, it is also possible that increasing FB likes causes the FB algorithm to increase the number of pro-Sanders stories in your feed which increases your support and enthusiasm. Also I made a map! Submitted by akreider on Wed, 03/30/2016 - 21:20.